Camp is for all positions ages 6-16 focusing on football as well as role modeling and leadership with each player receiving individual instruction from Elijah Holyfield and Mecole Hardman and opportunity to get an individual picture with Elijah Holyfield and Mecole Hardman. Dress in athletic clothes, cleats or sneakers (non contact camp so no pads or helmets). After registration form below is completed and a payment is made, you will receive a payment confirmation from PayPal to confirm they are registered. We will email the detailed camp schedule on 7/8/19 with all camp information including what to bring, what to wear, etc. 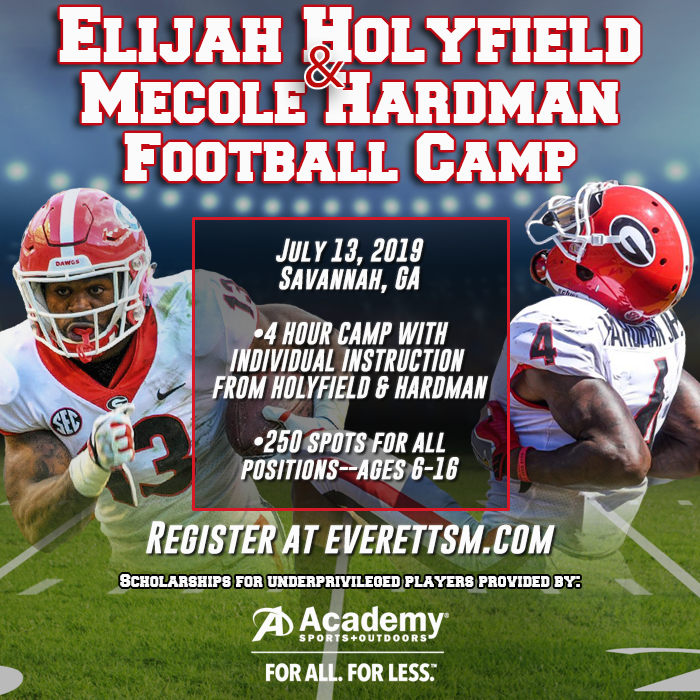 Holyfield & Hardman Silver Package $75.00 4 hour camp coached by Elijah Holyfield and Mecole Hardman including photo opportunity with Holyfield & Hardman and instruction from both players. Holyfield & Hardman Gold Package $115.00 4 hour camp coached by Elijah Holyfield and Mecole Hardman including photo opportunity with Holyfield & Hardman, instruction from both players and 8x10 pictures autographed by Holyfield & Hardman. Holyfield & Hardman Platinum Package $135.00 4 hour camp coached by Elijah Holyfield and Mecole Hardman including photo opportunity with Holyfield & Hardman, instruction from both players, 8x10 pictures autographed by Holyfield & Hardman and camp shirt.